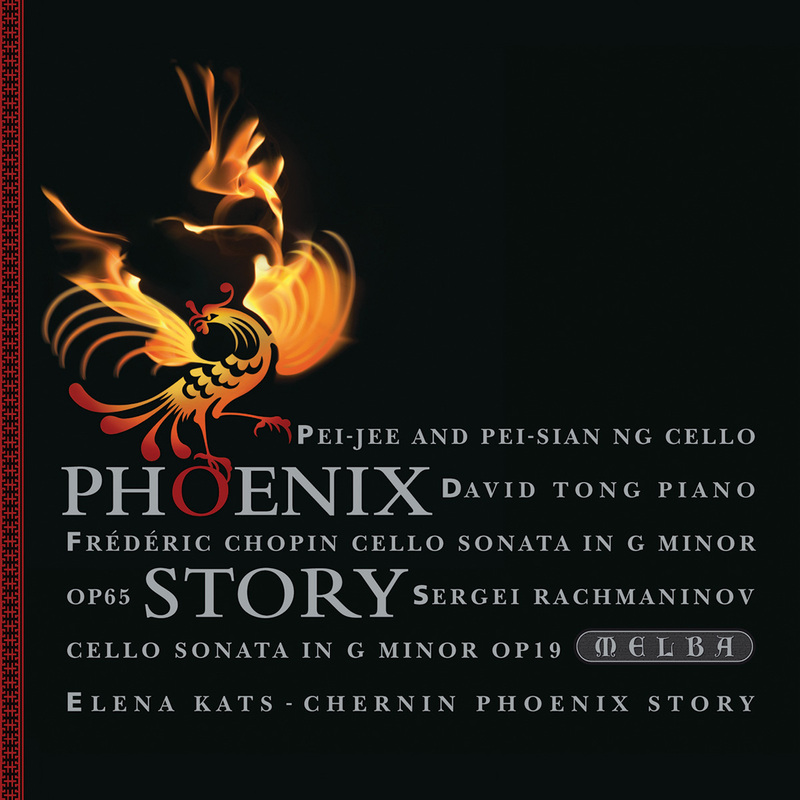 Featuring the world premiere of the eponymous Phoenix Story by Australian composer Elena Kats-Chernin alongside music by Chopin and Rachmaninov. The enchanted sound-world of Ravel’s chamber music is the perfect playground for imaginative violinist Kristian Winther. This outstanding collection of music for cello features two brilliant young Australian-born cellists and a young pianist of comparable distinction who form a natural partnership. Together they grip the listener in two essential chamber works by great pianist-composers, for whom the piano is of primary importance in their output. Both works are duo sonatas in which the combination of cello and keyboard make a fascinatingly contrasted musical balance. Where Chopin provides a natural lyrical dialogue between equals, Rachmaninov involves the two instruments in a more powerfully contrasted interplay, with the piano taking an almost concertante role at times against the full-blooded cello line. Chopin was one of the very few composers to have established an unassailable reputation both as composer and pianist from the very beginning of his career – a duality that has remained with him until today. Surprisingly, his exact date of birth is uncertain, although he was born into an artistically talented bourgeois Polish family in 1810, probably on 1 March. His parents and immediate family were cultivated and soon recognised their son’s precocious musical ability. By the age of six his pianistic skill was remarkable and a year later he was playing in public and composing short pieces. And he was soon absorbing the local folk music that he heard all around him and which soon became part of his creative being. After studying at the Warsaw Conservatoire he launched his performing career in Vienna in 1829. The Viennese public found his playing much more delicate than they were used to, but recognised the elegance and originality of his style, especially when compared with his flamboyant contemporary, Liszt. In 1830 he scored a popular success with his F minor Piano Concerto and in 1832 his Paris recital, with Liszt and Mendelssohn in enthusiastic attendance, finally established his career, while he made a considerable supplementary income giving lessons to the daughters of noble families. (He was also shrewd in business matters and was well paid by his publishers). The key romantic figure in Chopin’s life, of course, was Georges Sand and for all the controversy surrounding their relationship, there is no doubt that it was a loving one. She looked after him caringly during his increasing illness, and the years they were together, from 1836 to 1846, were mostly happy and musically productive, although their affair ended tragically in mutual misunderstanding, mainly caused by her family. The Cello Sonata (Tracks 1–4) came at the end of this period. It was Chopin’s last published work, written in 1845/46, and its gestation was not an easy one. Although he was primarily a miniaturist, he created four diverse yet balanced movements that add up to a very satisfying whole because of their pervading romantic lyricism. In his last years, during which he was bedevilled by ill health (he was to die from tuberculosis just three years after completing the Cello Sonata), Chopin had been searching for an expanded form of romantic expression, which matched romantic ardour with a ruminative exploratory feeling. This reaches its zenith in the sonata’s brief, yearning Largo (Track 3), where the rich cello line, usually answered by the piano, has a searching improvisatory freedom that is gently, almost darkly expressive. Yet the first movement – as long as the other three movements are together – is the most ambitious (Track 1). Its pensive opening is shared perfectly between the introductory piano and the answering cello, and suits them equally. Their dialogue is at times thoughtful, at others more passionate, but the rich melodic flow permeates every bar. The Scherzo that follows (Track 2) offers a brighter interlude, sparkling rhythmically, but with a touchingly, lyrical centrepiece. The lively finale (Track 4) again has a warmer touch, and here the cello and piano engage again in more extrovert, brilliant interplay to bring the work to a light-hearted conclusion. Unlike Chopin, Sergei Rachmaninov was born in 1873 of a union between two initially wealthy noble Russian families. But his father was dissolute, and the family estates had to be sold to pay his debts. Fortunately Rachmaninov’s musical talent was recognised at an early age and he received professional teaching, eventually winning a scholarship to the St Petersburg Conservatoire. A lazy student, it was only when he became a pupil of Nikolas Zverev, who was a strong disciplinarian, that he began to flourish under a strict regime of study, practice and performance. In the summer of 1886 Rachmaninov made his first attempts at composition. He was undoubtedly fired by hearing the famous Russian composer/pianist, Anton Rubinstein play, and developed a lifetime’s admiration for him. At that time Rachmaninov himself played at recitals at Zverev’s house before distinguished guests, including Tchaikovsky, who was to provide an even more important influence on his career. In 1887 he wrote the first of his compositions, a Mendelssohnian Scherzo, to survive and in 1890/91 the First Piano Concerto. The first Trio Elégiaque followed in 1892 and the opera Aleko appeared in 1893, greatly admired by Tchaikovsky who suggested that it be performed on a double bill with his own opera, Iolanta. In 1895 came the premiere of his First Symphony, which was such a disaster that the composer apparently destroyed the score; but in 1947 the original orchestral parts were rediscovered and it could again be heard and is now a part of the repertoire. But the work that firmly established the composer’s reputation was the Second Piano Concerto, which in 1901 made an immediate and lasting impression on the wider musical public and was to become one of the most loved of all romantic piano concertos. The Cello Sonata (Tracks 5–8) was also written in 1901, not long after that famous concerto, when the composer’s creative powers were at their peak. The sonata shares with that masterpiece a strong and memorable vein of rich lyrical melody, and it is soon obvious that it is to demand great virtuosity of both players. In its passionate feeling Rachmaninov did not create an easily maintained balance between the two instruments, but who will mind when the music has such a powerful and inspirational forward flow? The first movement (Track 5) opens passionately with a dominating, yearning main theme, but it is the piano that has the second subject and, indeed, carries the argument forward, even providing a concerto-like cadenza before the recapitulation. The vividly sparkling Scherzo (Track 6) comes second, with the two instruments closely inter-twined throughout, with the finale (Track 8) offering a comparable dialogue every bit as thrilling and virtuosic, although again with a strongly romantic secondary theme. But it is the lovely Andante (Track 7), which is so redolent of the slow movement of the Second Piano Concerto, that stands out in giving the cello an almost orchestral role with its ardent melodic flow often punctuated by piano chords. This is truly a work that justifies the composer’s belated reassessment in the updated New Grove Dictionary of Music and Musicians as ‘the last great representative of Russian late romantics’. The two movements that make up Elena Kats-Chernin’s Phoenix Story (Tracks 9–10) were originally related but separate pieces. Yet although very different, they are both derived from the same indelible basic theme, so they make a natural pair. The surprise is that this seemingly Oriental melody, although basically pentatonic, does not finally emerge as specifically Chinese/Oriental but has a much wider character, so marrying an Eastern and Western ambience. But more and most importantly, this is essentially melodic music throughout making it a perfect foil for the two companion romantic sonatas written more than a century earlier. The movement titles derive from traditional Chinese culture in which the symbolic figures of the phoenix and the dragon are usually paired together; the dragon represents the male and the phoenix the female, symbolising blissful balance (yin and yang). The first movement, ‘Tears from Above’ (Track 9), opens pensively to a rocking rhythm, but as the melodic repetitions continue they are extensively decorated, and the music’s tension gradually becomes more concentrated. The effect is not unlike that of a chaconne with a reflective interlude leading to a full-throated climax, but ending peacefully. In admirable contrast, ‘Courting the Dragon’ (Track 10), the second movement, is a virile affair with the theme becoming a powerful ostinato that drives the work on past a lyrical counterpart that soon emerges, to its strongly realised conclusion. This recording was supported by the Australian Government through the Australia Council, its arts funding and advisory body.